at risk from more serious medical conditions. leaves skin healthier and more youthful looking! Skin is at the interface between the body and its external, often hostile, environment and its epidermal barrier prevents both the escape of moisture and the entry of toxic substances. Reviews of the formulation to treat, protect and renew thin dry sensitive skin and help fight skin irritation, inflammation and aging. I love this cream for my face and hands. It is healing and moisturizing and makes my skin look plump and youthful. I just gave some to my 84 year old mother and she thinks that it helps keep her skin supple and smooth. Repeat purchase. This stuff really works. Highly recommend for anyone with excessively dry or thin skin on their hands or forearms. Has strengthened and moisturized the skin preventing cuts developing from minor scrapes. Will continue to use. This product really works. It was recommended by my podiatrist for my very dry feet. This is my second purchase. Great moisturizer: no perfumes. Does exactly what it says it will, protects skin, treats dryness. I was very skeptical that this cream would perform as described. Because of a genetic medical condition, I have very fragile, sensitive, itchy skin. The effects were very subtle at first but after using an entire tube, I saw a noticeable improvement in the skin on my arms where I was using this. The texture improved, the resilience of the skin improved, and all rashes resolved. It is pricey, but I just use it and problem areas and so it lasts a reasonable amount of time. This cream is the best for thin skin that easily bruises. I love it and will never be without it. I am a 65 year old woman who owns her own Real Estate business. I am also very active and play golf a great deal. I have had chronic asthma since my freshman year of college and for 25 years was on predisone (steroids) for prevention of severe attacks. Because of the steroids, my skin got thin as paper and for the last 25 years if I even bumped into the fabric corner of our couch, my skin would just rip open, rips as much as 4 inches across. I have white scars all over my legs as a result of the many tears on my legs. I tried everything and when my Dr. suggested the bulky shin coverings that mature people in nursing homes wore, I said absolutely not. 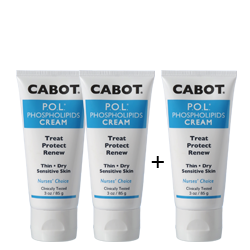 I came across your product CABOT POL cream and my goodness, in just a week of using on my lower legs I have elasticity in my skin again. I can bump into furniture without the fear of my skin ripping. I cannot believe what your product has done for me. Just the smallest of luxuries like taking a bath without hanging a damaged leg over the side as it was healing is not longer an issue. 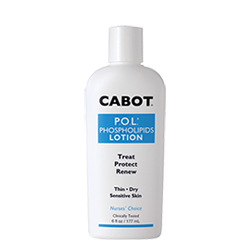 Your CABOT POL lotion has done what no other lotion could do and I hope this true and freely offered testimony will lead other people to this wonderful product! I just had to tell you how thrilled I am with P.O.L. cream! I am 60 years old, have M.S. and have used a wheelchair(manual) in my home for the past three years. About two weeks ago my aide said that I had a red mark that, within two days morphed into an early stage 2 pressure sore! I did a bit of research on line and came across P.O.L cream liked what I read and ordered some. I started using it last Friday. Twice on Fri. three times Sat. and Sun. and today, Monday, it is totally healed! Nothing short of miraculous! I can only say thank you from the bottom of my heart! I have experienced significant bruising and sometime bleeding from scrapes and cuts of my arms and to a lesser extent legs due to use of a needed blood thinner medication since 2006. About three years ago a friend of mine had a similar problem and recommended I try the Cooperlabs Cabot Cream that helped her skin condition. 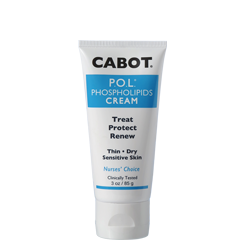 I have been using the Cabot Cream daily and it has helped me tremendously. Although I still get bruising from my blood thinner RX my skin has been softer and I have had a very significant reduction of bleeding from the thin skin. I hardly remember the last time I had to use a bandage or band aid since I started using the Cabot crème several years ago. I have been very pleased with this product and will continue using it in the future. It has been great for me. I had ordered your special with Musk Oil and a free tube of the POL cream. Recently I had been using the Efudex cream chemotherapy treatment on my face. It was painful and I developed a reaction to it. in turn helped keep the pain away. It was wonderful and my skin is now so smooth and soft.THANK YOU !! A long time customer and user of Musk Oil, once again I have found a great Product through your company! Thank you so much for your P.O.L. cream. It has made a big difference for my mom and her quality of skin health. We appreciate you very much. I would be happy to be give any feed back you might need on your product. It is a positive and wonderful product. My husband was bedridden after a stroke. Everything was tried – everything possible for bed sores. He was a big man. He had a special mattress. He was in bed for five years after the stroke – in bed and in a wheelchair. I purchased P.O.L. and it helped tremendously. He died with no bed sores. It was miraculous in what it did for my husband – it relieved the pain.